After breakfast, scenic drive or fly to Pokhara. Afternoon, walk around Lake city. Early evening, Trek briefing and final preparation. After breakfast, Drive to Birethanti 45 kms and start the trek along the stream. It is a beautiful but steep walk passing by waterfalls and Magar villages to the Ghandrung. Stay overnight over there with the beautiful views of Ghandrung. We descent down through stone steps of Ghandruk village past several tea houses, After crossing a stream on a suspension bridge the trail drops in to the Modi Khola valley and reaches Landruk-Tolka and ascent couple of hour to Pothana. The trail follows through rhododendron forest before arrive Dhampus, it is inhabited by a mix of people: Gurung, Brahman, Magar communities. From here work down to mostly downhill through forest to Phedi from here 30 minutes drive to Pokhara. I had a wonderful time in Nepal and on my trek. Your guide Rabbin was excellent!!! He really made sure i was well taken care of and that i was ok all the time. The porter Amrit was also a great guy and i was fortunate enough to have had them both with me on my trek. Please pass on my thanks to them both. I had a wonderful time on my trek and do look forward to coming back in the not too distant future. All in all an excellent holiday and i will recommend you to my friends in future. Thank you for a truly great experience! Dhanyabad. We felt very well looked after throughout all of our trip - amidst the chaos of Kathmandu, Nepal Frienship Tours organised our whole itinery with great efficiency and friendliness. Nothng seemed to be a problem - even our bags not arriving on the plane with us was taken care of with no fuss. We would like to say a special thank you to our Guide Babu and our Porter Ram-Kishna. spirit on a number of occassions ran ahead to ensure that we had rooms for the night. Ram-Kishna humbled us with the ease and grace with which he carried both of our bags for 10 days without putting a foot wrong ! 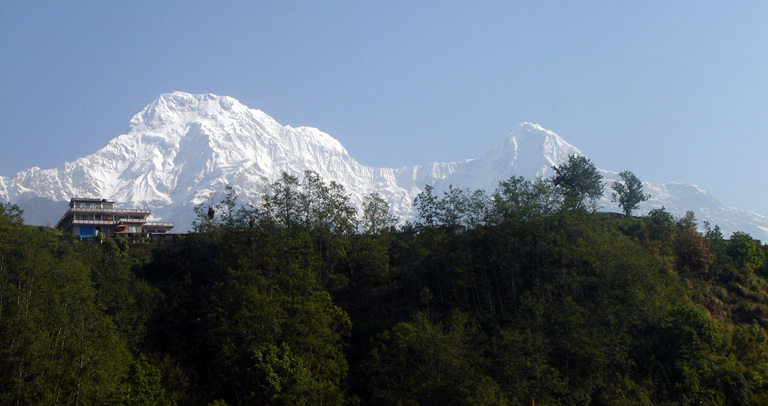 Our evenings of Dal Bhaat, playing cards, Nepalese singing and toasting our feet on hot coals within the splendour of the Annapurna Sanctuary will bring a smile to our faces for many years to come. So thank you all so very much for a fantastic holiday, we will never forget it and will certainly recomend Nepal Friendship to anyone we know who wants to go trekking.